Just like humans, ferrets make different noises for different emotions. Some ferrets are more talkative than others. I’ve heard of ferrets that never make a sound, while others chuckle all the time. – A clucking noise that comes from a happy woozel. Some people think the dook resembles the sound of a clucking chicken. – A hissing sound (sounds like that of a cat only not as scratchy) comes from an annoyed, mad, or a ferret that wants to play rough. – A loud chirp that occurs from a very excited or frightened furball. If your fuzzy makes this noise, make sure you know why. If he is in danger assist him immediately. – A high-pitched sound accompanied or even replaced by rapid chattering. The Screech is a reaction to extreme pain, fright, or anger. If your fuzzy makes this noise, make sure you know why. If he is in danger assist him immediately. – A low or high complaining cry. Your fuzzy will make this sound if he is injured, wanting attention, or scared. If your fuzzy makes this noise, make sure you know why. If he is in danger assist him immediately. First off, ferrets sleep up to 20 hours a day! Now that’s a lot of sleep! Now it makes sense as to why you need to play with them as much as you can when they are awake! Ferrets tend to sleep in the most uncomfortable positions, at least according to us humans. But to the ferret, it is the most comfortable position ever! Usually, when you see a ferret, it is sleeping in a spiral. Some ferrets like to sleep with their noses hanging out of the hammock, while other like to sleep on their stomaches or backs. Some even like to sleep with their mouth open, or sometimes their mouths just fall open. Because fuzzies sleep so much, they work hard to find the most comfortable positions to sleep in! Since fuzzies sleep so much, they must dream right? Yes, they do dream. Occasionally, when the ferret is sleeping, you will notice him twitching – this is when your ferret is dreaming. Sometimes ferrets make little dooking or whinning noises when they are asleep, this is also a sign of a ferret dreaming. Humans get an occasional itch here or there, but what about fuzzies? Do they just sleep through their itches? Sometimes! Actually, know matter how deep of a slumber your woozel is in, it will sometimes wake up for the occasional itch. When your woozel has an itch while sleeping, he will jump out of his hammock like a cat getting a bath and scratch that itch, dangit! Even if it requires bumping into a couple of walls (you know how it is when you’re tired! ), your fuzzie will get out of bed to take care of his annoying itch. After the itch has been taken care of, the fuzzie will imediately go back in the hammock like nothing has ever happened. Some ferrets snore. Yes, they really snore, just like humans do. Well, of course it doesn’t really sound the same, but that’s obvious because ferrets’ noses are not nearly as large as our noses. When a ferret snores, it sounds just like he is breathing hard. Nothing like when humans snore (yes, I do have experience!). After your little baby wakes from a long slumber, he will most likely take awhile to get up to speed. The following are some very common things that ferrets do after a nap. Ferrets seem to shiver when they wake up from sleep. This is because as they sleep for 18+ hours their blood lowers in temperature. When the ferret eventually wakes up, they have to shiver to make their blood temperature go back up again. So don’t worry if your ferret shivers right after sleeping. Ferrets almost always need to go after they have awakened from a nap. If you are just litter training your baby, place him/her in the litter box every time you see him awaken. If your ferret hops out, just place him back in. Continue to do this until your ferret eventually goes poopie/pee. 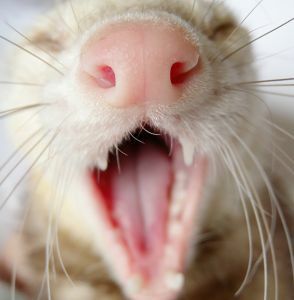 When ferrets just get up, they seem to yawn and stretch a lot. This is very common, so don’t worry if your ferret does this right after sleeping. After all of that sleep, wouldn’t you think a ferret would be ready to play? You got that right! You will need to play with your ferret at least 4 hours each day. This means not only letting him out of his cage, but also actually interacting with him and playing. 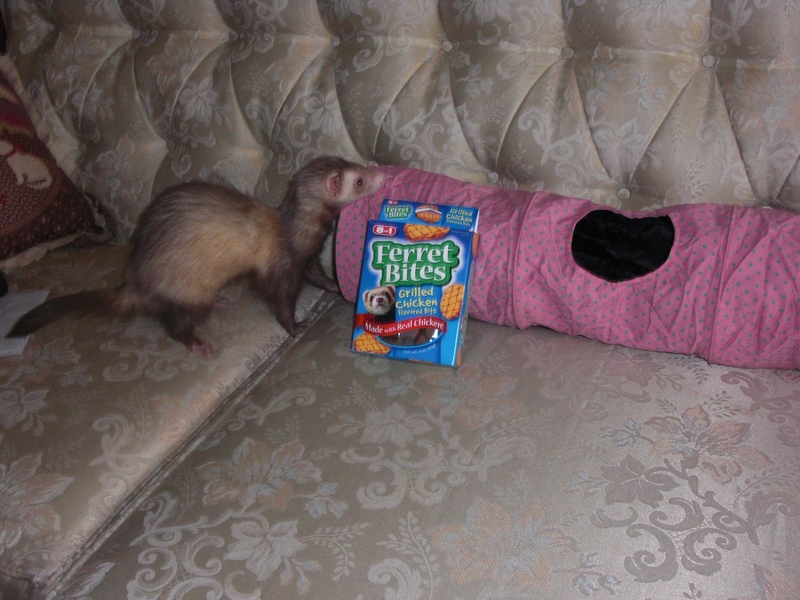 Ferrets love attention and sometimes a toy or other playmate just isn’t as fun and engaging as a human playmate. The “Weasel War Dance” is a play dance put on by ferrets who get too excited and can’t control themselves. The ferret bounces all about, sometimes flipping over, opens his mouth, and if really having a good time will puff out his tail. It is really fun to see, and believe me, you’ll know it when you see it! If a ferret gets bored while out and roaming, he will sometimes just “plop” on the ground and lay there. Ferret owners call this the “Speedbump” because the ferret looks like a small speedbump. 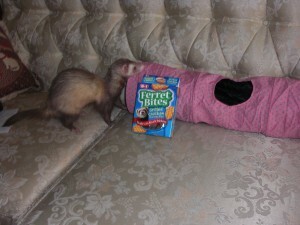 This is pretty normal for ferrets to do, however, you may want to provide more things for your ferret to do while out of his cage.